Teenage Drinkers Go For High-End Liquor And Cheap Beer, Too : Shots - Health News Liquor companies have gotten a lot of heat for marketing sweet, fruity drinks that appeal to underage drinkers. But teens also favor premium vodka and whiskey. Cost isn't always driving choice. 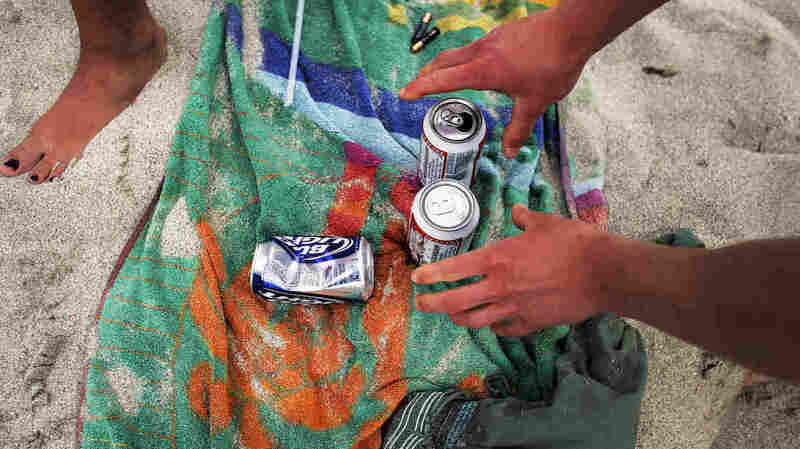 A college student reaches for a beer during spring break in Miami. For underage drinkers, it's not always about the cheapest alcohol they can get their hands on. Many of them are brand conscious, researchers say, and they're not drinking the same stuff as their parents. Young drinkers do go for sweet malt beverages that mask the taste of alcohol with fruit flavors; 17 percent said they'd had a Smirnoff malt beverage, which comes in flavors like grape and frozen strawberry lemonade. But it's not only about cheap and sweet. Teenagers do favor budget beers like Keystone Light, and 28 percent of teen drinkers said they'd had a Bud Light in the past month. But they also drink pricey hard liquor like Jack Daniels whiskey and Grey Goose vodka. Market research reports for adults showed only 6 percent of adults say they drink Smirnoff's malt beverages. And while 11 percent of underage drinkers said they had had Jack Daniels, just 6 percent of adults say the same. "It dispels the myth that youth are drinking what they see adults drinking," says Dr. Michael Siegel, a professor of community health at Boston University and the study's lead author. He and researchers at the Johns Hopkins school of public health surveyed over a thousand underage drinkers between the ages of 13 and 20. The results were published online in the journal Substance Abuse. "They don't just go out and choose whatever brand is available," Siegel says. And, Siegel tells Shots, brand loyalty held true even after the researchers controlled for household income. 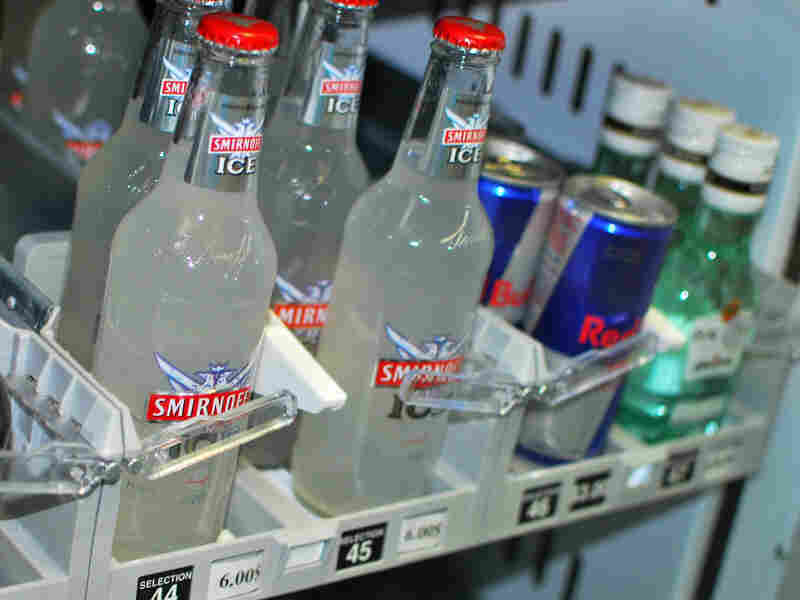 Smirnoff Ice malt beverages in sweet fruity flavors are popular among underage drinkers. "It's not just about getting drunk," he says. "There's something else going on here." But right now we don't know exactly what that is, Siegel says. It could be that these brands are appealing to teens through advertising, he says. He and his colleagues have already started looking into whether advertising affects teen's choices. In 2003, beverage makers adopted an industry-set standard that requires at least 70 percent of the audience viewing their ads to consist of adults older than 21. And they've been pretty good about complying, according to a report that the Federal Trade Commission released Thursday. Based on advertising expenditure and ad placement information reported by 14 major alcohol companies, the FTC study found that 93 percent of alcohol advertising met the industry standards in 2011. But a study from Georgetown University found that TV advertisements from many alcohol brands, including Smirnoff and Budweiser, were disproportionately targeted toward young people. Alcohol industry representatives say that's not true. "We do not want people who are not of age drinking our products," says Alix Dunn, representative of Diageo North America, the company that makes Smirnoff Ice. Siegel says that while adults may still have an influence on underage drinkers' preferences, this study shows that it's not the only factor at play. Once we pin down why kids love certain types of beverages, he says, we can better understand how to stop underage drinking.